The art has not been impressive this week for Marvel comic books. Yesterday's comic of the day had a nice exterior with poor interiors, while today's Daredevil #510 has nice interiors and a horrible exterior. 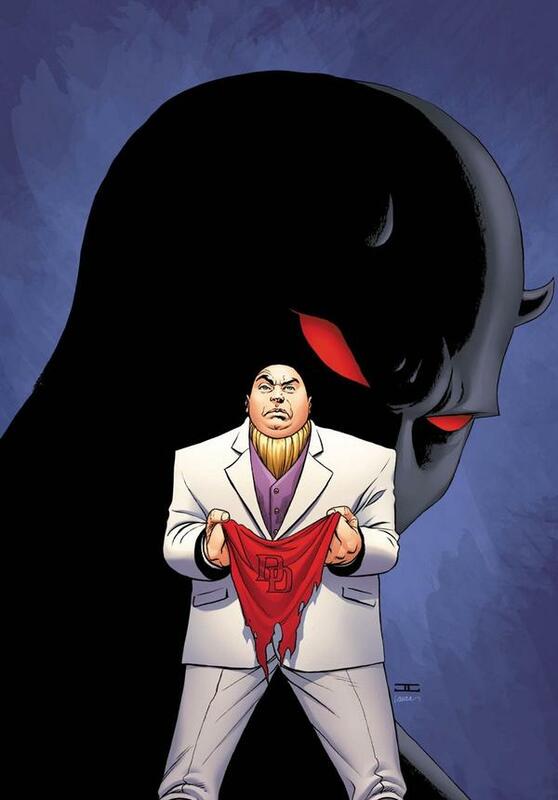 If John Cassaday took more than 10 minutes on this cover I will be extremely surprised: a generic looking Kingpin holds a torn part of the standard red Daredevil uniform (which actually looks like a mini torn red DD cape) with a black clad red-eyed Daredevil head in the background. The cover has no movement, no creativity and Laura Martin's colors don't even help the imagery pop. On a scale of 1 to this cover doesn't even deserve a quality scale I'd give this cover a "RU", as in "RU" serious? I will mention that Marco Checchetto pencils and Matt Hollingsworth's coloring combination make for some nice storytelling in Daredevil #510. The tone of the story is supposed to dark, and the evil evolving in Daredevil's Shadowland should be covered in a blanket of blackness. The inside panels add to the Shadowland experience, where as the cover...makes readers question picking up the next issue in the arc.